Eintracht Frankfurt’s Marco Fabián has recently been voted the third best offensive midfielder in the prestigious winter kicker Rangliste des deutschen Fussballs. 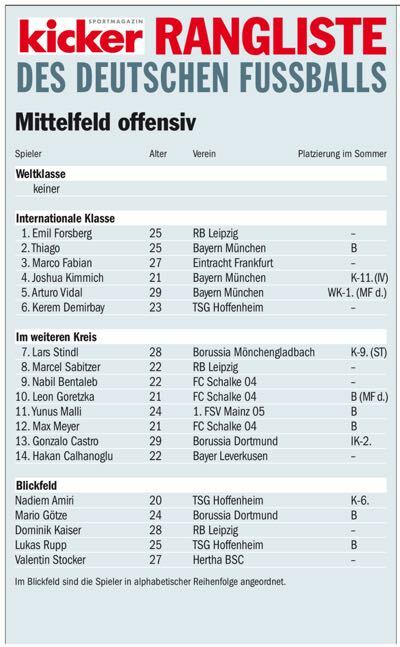 The Rangliste in kicker ranks the best players in each position in four categories: world class, international class, among the best, and one to watch, and has been a part of German football since 1956. The ranking is tough, and very few players make it into the world class category—this season no offensive midfielder was ranked in the highest category. Being ranked in the international class, however, is still a big honour, and the kicker acknowledged that Fabián has now broken into the Bundesliga elite among attacking midfielders. Ranked third, just behind RB Leipzig’s Emil Forsberg and Bayern München’s Thiago, Marco Fabián was featured in the ranking for the first time. It is a remarkable turnaround for the technically gifted Mexican who had struggled after joining Eintracht Frankfurt in January 2016. When Frankfurt signed Marco Fabián from Club Deportivo Guadalajara for €3.7 million, the transfer was understood to be a real coup for die Adler. Frankfurt was able to land the Mexican star, because Fabián had an exit clause that allowed him to join a European club for $4 million. High salary, and the fact that national team players are treated like superstars in Mexico, means that Mexicans seldom leave their home country to play abroad. Nevertheless, Fabián wanted to prove that he could play at the highest level in Europe. A move to Germany, and to Frankfurt in particular, was risky, however. The Mexican magician did not speak the language, and Frankfurt were in a relegation battle. Also, within a few months of Fabián’s arrival, Frankfurt fired head coach, Armin Veh, and replaced him with Niko Kovac. Kovac managed to save the club by beating 1. FC Nürnberg in the relegation playoffs—but Fabián played little to no role in Frankfurt’s fight for survival last season. Then, during the summer transfer window, there was talk that Fabián could be on his way out of Frankfurt. Several clubs in Spain were especially interested in signing the Mexican. Spain, culturally and in terms of playing style, would have been an easy way out for Fabián. But the Mexican magician ended up staying in Germany and worked hard during the summer break to ensure that he would have the necessary physical fitness to compete in the Bundesliga. Kovac, however, did not field the Mexican in the first two matchdays of the Bundesliga. Marco Fabián, did not give up, however, and continued to work hard in practice. Many of his teammates had believed that he was amongst the best players in the squad, but Kovac had felt that he was not ready at the start of the season. Then on matchday 3, Kovac started Fabián against Bayer Leverkusen in what was the widely anticipated battle between two Mexican superstars—Marco Fabián and Javier Hernández, better known as Chicharito. Many had feared that Fabián would not feature in the match. Kovac fielded the attacking midfielder in the starting eleven, and Fabián stole the show by assisting when Alex Meier opened the scoring in the 53rd minute. Later, Chicharito equalized for Bayer Leverkusen, but Fabián had the last word when he scored the winning goal in the 79th minute. It was Fabián’s breakthrough for Frankfurt, and the Mexican became a key reason for Eintracht’s success in the Hinrunde, as the club sits in fourth place going into the winter break. As mentioned in the recent Gegenpressing – Bundesliga Podcast, Fabián represents the new Eintracht Frankfurt under Kovac, which is slowly getting a reputation of being the Atlético Madrid of German football. Fabián’s technical abilities have already been outlined, but he also has a somewhat demonic side to him. The Mexican is not shy about playing tough, and using trickery against his opponents to gain an advantage. Those who follow CONCACAF, Liga MX, and the CONCACAF Champions League, and the Copa Libertadores know about the difficulties of playing in Central America. The CONCACAF Champions League games against Honduran, Costa Rican, El Salvadorian or Panamanian opposition, in particular, can easily decend into madness, as fans, opposing players, and sometimes referees, can make it hard to play away from home. As was correctly pointed out a while ago by FutebolCidade.com writer Nico Miremont, the Copa Libertadores is perhaps the hardest continental competition on the planet as, unlike in the UEFA Champions League, away games are still truly away games. Fabián has played in those difficult situations and, like many Mexican players, is no stranger to the cheeky game himself. In fact, it adds an element of surprise to his game as he often beats opposing players not just with his technical abilities, but also through physical play and by using mind games. Altogether, this makes Fabián one of the most interesting players to watch in the Bundesliga at the moment, and also completely justifies his current kicker ranking. Gegenpressing – Spieltag Spezial – Dele Alli to Bayern?